EarthBiAs2014 is organised by the School of Sciences of the University of the Aegean, in collaboration with Global Network for Environmental Science and Technology (GNEST). 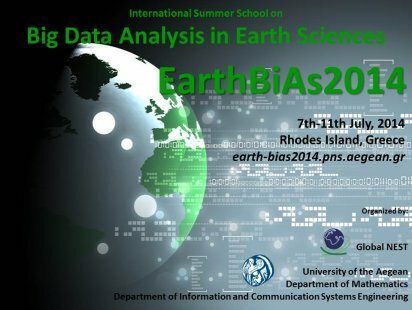 It is an international Summer School in Big Data Analysis in Earth Sciences and will be held in Rhodes from 7 to 11 of July 2014. EarthBias 2014 Summer School program provides a unique opportunity to the participants to interact with scientists from the University of the Aegean and others, distinguished institutions domestically and abroad. Issues related to real environmental applications will be addresses interdisciplinary with the use of of Data Analysis , Information technology and Mathematics.